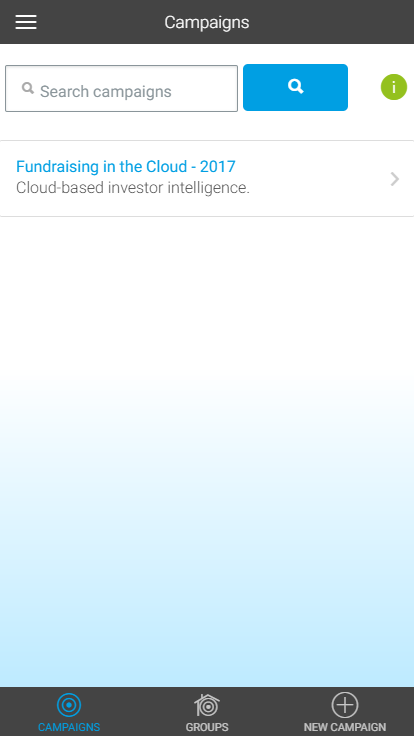 The campaigns section allows you to manage your capital raising campaigns. There are two different types of campaigns: individual campaigns and grouped campaigns (Groups). You can have all campaigns or all groups displayed by clicking on the respective tab. The active tab is showing in blue. When you click the Campaigns tab a table including all campaigns of you and your team will be displayed. The table is sorted by “Campaign Title A-Z”. Closed campaigns will be displayed at the end of the table. Groups can be accessed by clicking the Groups tab. Here you can view existing Groups and set up new ones. Groups are used to combine the values of multiple individual campaigns into one grouped view. When you use the Group functionality, the Target Size, Commited amount and Potential amount of all the campaigns you have selected to group will be aggregated. Therefore you can only group campaigns that use the same currency. Use groups to gain insight into multiple campaigns, e.g. different country specific campaigns, at a glance. By clicking the little triangle next to the group you can expand a group to display all included campaigns. Click New Campaign to create a new individual campaign. Individual campaigns are always country specific, you will need to select a country for your campaign. If you are raising capital in multiple countries, we recommend to create a campaign for each country. You can then combine all individual campaigns into one group. You can also opt to add a Target Size amount at this point or do this later. Click New Group to create a new group. • Important: You can only add individual campaigns to a group with the same currency. Click “Edit” to start editing a campaign or group. You can edit the information stored for a group by clicking the edit button. The following information is editable after a group was created. The Investment Status is split into Potential and Committed Investments. The amount listed for Potential and Committed Investments is aggregated from the values entered for the individual campaign members. The Campaign Members section includes all contacts that have been added to a campaign. 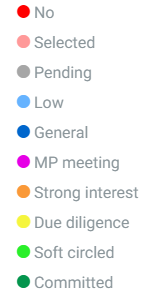 The status MP Meeting, Strong interest, Due diligence and Soft circled will be aggregated as the Potential investment of the campaign. 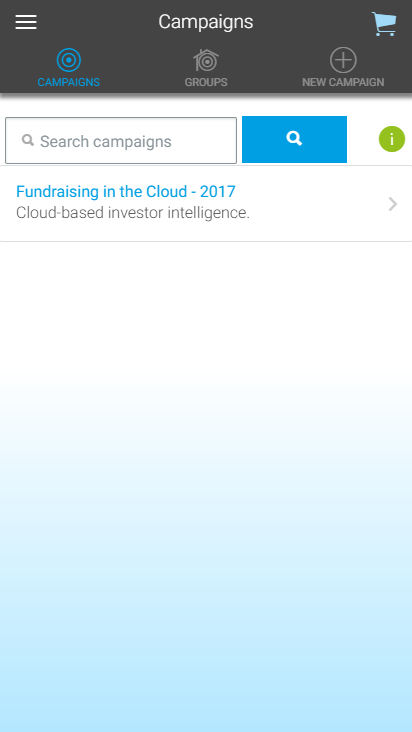 You can filter all members by Packages and/or Investor Type. To assign new contacts to the campaign, click “Add to Campaign”..
You can add a new task by clicking “New +”. You can filter the task list by team member or search for tasks. You can navigate between campaigns and groups using the bottom bar. Commands can be found at the top. You can navigate between campaigns and groups using the top bar. Commands can be found at the bottom.